Description: London, Nisbet & Co. Ltd. 22 Berners Street, W.1 1908 according to British Library Colour plates (28) to face each text page + square onlay colour print to cover not repeated inside the book. . 16mo cloth spined grey decorated boards with 80x60mm pictorial onlay (tips rubbed) pictorial end papers. Frontispiece + titlepage +pp blank +6-111pp +p blank. Some pressure marks to rear endpapers, lower cover with a few pencil marks. All text and all colour plates printed one side only, blank sides counted in page numbering though they are not themselves numbered. 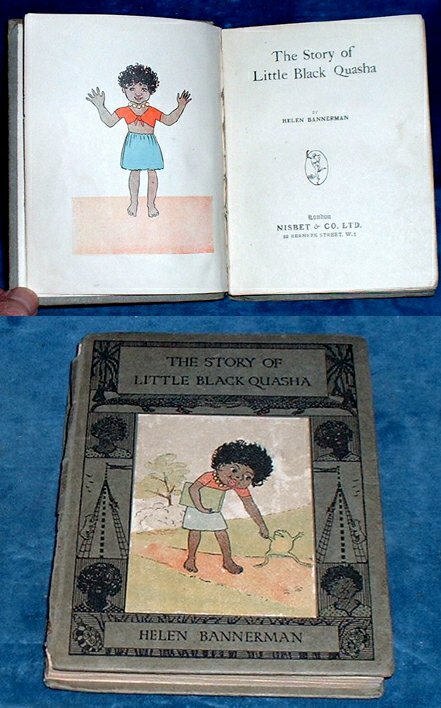 *A neat copy of this charming book by the author of Little Black Sambo.